This quick guide will show you everything you should and shouldn’t do if you want to fight your Dui charge. In addition to the tips in this book I recommend that you conduct additional research as it pertains to your situation. This is the short edition. This quick guide will show you everything you should and shouldn’t do if you want to fight your Dui charge. In addition to the tips in this book I recommend that you conduct additional research as it pertains to your situation. This book will provide you with contacts for free legal advice and the phone numbers for some of the best attorneys in Los Angeles. It will also contain stories from my personal experience and how I coped with the stress of being accused of dui. (I live in California so I do not have the phone numbers of other recommended lawyers in other areas and I wouldn’t want to recommend someone unless I know that they are qualified). No need to spend hours online searching for information or calling 40 lawyers just to be disappointed. I have done all the work for you. 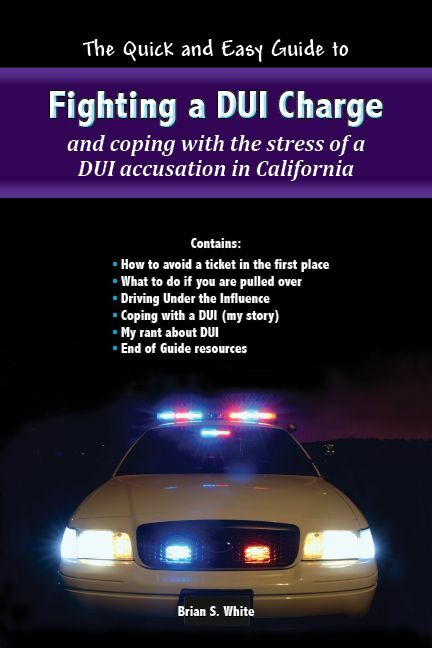 Absolutely everything you will need to successfully start fighting your dui is in this guidebook and the recommendations and website resources alone are worth the price of this book. I have also successfully fought a dui charge, After over a year of intense fighting I walked out of the courtroom without any sort of alcohol or dui related charge. For most people this is unheard of. Fighting a dui accusation is a long and difficult process where you will feel that the whole world is against you. There is no magic bullet to winning and only with proper detailed notes, photos, patience, and hard work can you succeed. You must do plenty of research, use the rules of the court, and cite case law. Even then you may still lose. A Driving Under the Influence charge is an extremely complicated area of the law and the advice of a qualified dui attorney is highly recommended. Preferably a lawyer that has gone to trial and is willing to fight for you is advised. Under no circumstances would I recommend fighting a dui accusation without the help of an attorney. I repeat under no circumstances would I recommend fighting a dui accusation without the help of a competent dui attorney. This book is only intended to offer basic advice as it pertains to a driving under the influence charge. The main purpose of this book is to inform you of all of your options so that you can make an educated decision. This book is only meant to be the first of many steps in order to successfully beat a dui accusation. Please consult the advice of a professional lawyer if needed. All information is current at the time of this writing however policy and regulations change often and it is in your best interest to do proper research. I am not liable for any legal or personnel hardships that you may face. Again when in doubt ask a lawyer. Most lawyers in any legal practice will allow you a free consultation between twenty minutes to an hour and I advise you to consult with several of them as in pertains to your specific situation. Past results not an indication of future performance. All opinions and text protected by the First Amendment of The United States of America Bill of Rights, and current copyright laws. Nothing may be reproduced without my written consent.